There is no place, it seems, that feelings do not run high about feelings. Western civilization is still caught between adoration of the emotions as sublime and denigration of them as merely animal. Can we trust our feelings? Should we suppress them or should we indulge them? In what part of our persons do feelings occur? Contemporary Christianity is no less vexed about emotions. The rise of the charismatic movement in the late twentieth century, with its emphasis on experiential Christianity, has led to an equally strong reaction of suspicion against talk of the emotions as significant for the Christian life. Though these questions have an everyday, practical importance, they also point to profound theological questions about the nature of the triune God and the ascription of emotions to him in the Bible. Does God himself have feelings? This stimulating volume, based on the 2011 Moore College School of Theology, offers perspectives on emotions. Topics include a cultural overview, theological anthropology, the question of divine passions, the emotional life of Jesus, the Spirit's work in perfecting emotions, preaching the Gospels for divine effects, and the place of the emotions in corporate worship including connections with singing and music. The contributors are Rhys Bezzant, Peter Bolt, Gerald Bray, Andrew Cameron, Keith Condie, Richard Gibson, David H�hne, Michael Jensen, David Peterson and Robert Smith. 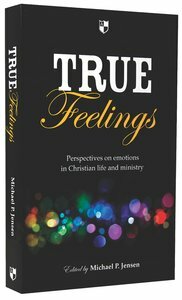 About "True Feelings: Perspectives on Emotions in Christian Life and Ministry"